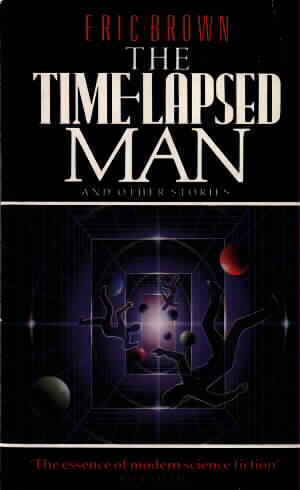 Eric Brown: The Timelapsed Man. A book review by jpoc. This is Eric Brown's first collection of short stories. Indeed, it includes his first ever published tale "Krash-Bangg Joe and the Pineal-Zen Equation" which is remarkable for just how good a debut it is. "Krash-Bangg Joe" opens with the line "I'm dropping acid shorts in the Supernova slouch bar when the call comes through." It's one of the most attention gathering first lines the I have ever read. it has the same sort of "cyberpunk meets Chandler" grip as the opening to William Gibson's Johnny Mnemonic. It introduces a story of telepaths, cheap investigation agencies, love and revenge that really makes the reader pay attention. Alone, this story is worth the price of the whole book and the time to read it all. The same is also true of the title tale in which a spacer's senses become detached from current time. Those are the highlights here but the other stories are all worth reading too. There are eight stories in all, six of which first appeared in magazines between 1987 and 1989 the other two are original to this collection. Most of the tales are set in a medium future Sol System in which star travel has become possible through a form of mental projection through the void. It's a little like the idea in Robert Sheckley's tale "Specialist" though much expanded. Eric Brown is a better at short stories than novels and this is a very fine collection. All of the stories are well paced and, despite the limits of the genre, he introduces real characters that the reader can understand. It is a perfect introduction to the author's work. The SF here is hard and the material bridges the gap between mainstream and cyberpunk. That means that it will have a wide appeal and I recommend it to any SF enthusiast. Nine out of ten. Some of the eighties' best SF shorts.